This model is discontinued. 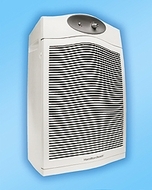 As an alternative, we recommend the Hamilton Beach 04161 TrueAir Ultra UV Air Purifier. A smaller air purifier for areas up to 350 sq. ft. Perfect for the baby's room, home office or your small living room area. HEPA replacement filters are much less expensive for these air purifiers than most, and only need replacing once a year. For 18 x 19 ft. rooms - 350 sq. ft. Size: 24.9" x 17.9" x 12.9"